I was cycling downhill in the town where we live, following my son at around 28mph (in a 30mph limit) when an impatient Audi driver decided to squeeze into the gap between Father and Son, and then tailgate my 11yo as he rode along. My son pulled over when it was safe to do so but he was scared – and there was no justification for the driver’s actions. Finally, whilst turning left, a motorist overtook me, on the junction itself, leaving around 18 inches to ride in between his car and the kerb, rather than follow the highway code ruling to “give motorcyclists, cyclists and horse riders at least as much room as you would when overtaking a car”. I called out and was actually forced to use his car to steady myself. As he drove off, the usual hand signals were observed, along with some unintelligable expletives (from the driver, not me – I was in shock). Over the Easter holidays, I was lucky enough to enjoy a skiing holiday in the French Alps with my family. Aside from the holiday leading to me finally accepting that my kids are now both better skiers than I (after 2 seasons my 11 year-old is skiing black runs and my 9 year-old is on reds whilst I, on the other hand, lack their low centre of gravity and absence of fear), the road trip there and back gave me a chance to a) test out our new Volvo XC60 on a decent journey (it is very comfortable) and b) follow a friend’s advice to use an electronic tag for convenient passage through French autoroute tolls. After a successful pilot with the same tag system (but different operator) on the UK’s M6 Toll, I felt ready for the SANEF Liber-T tag, which even has a billing option aimed at UK motorists travelling to France. The instructions for mounting the tag were different to my M6 Toll experience and I have to admit I’m not sure I have it quite right (maybe I should try the back of the mirror next time) but some waving of the tag at the readers seemed to kick things into life on the occasions that the barrier didn’t rise on my approach! Back home in the UK, my tolls were arranged into one bill, and paid monthly (albeit with a currency conversion charge) but the convenience (and the ability to cruise through dedicated toll lanes at the péage) makes it worthwhile. The Liber-T tag works on all toll motorways in France (excluding the Mont Blanc and Fréjus tunnels), regardless of operator. Following my experiences with the Dart Charge (see part 1) and in preparation for an upcoming trip to France where I planned to use electronic tolls, I decided to try out a similar system on Britain’s only private Motorway – the M6 Toll in Staffordshire. So, on the way back from the office one day, I picked up an M6 Toll Tag at Norton Canes service area, which came pre-loaded with £25 of credit (the same as I paid for the tag). Then, by calling up and opening an account, I was given £10 more credit; and by topping up with another £30 of credit, I was given another £5. So, that’s one tag with £70 of credit for £55. Even with a monthly charge of £1 that means I’m up by a few quid (and a corresponding 5% discount on journeys should go towards the monthly charging over time). After fitting the tag to the back of my rear-view mirror, I drove (with some trepidation it has to be said) towards the barrier, heard a re-assuring “beep”, saw it lift, and then cruised on through the toll booths. Result! With a tag working through my car’s heated windscreen on UK roads, I was in business – ready for the next adventure, on French Autoroutes! London’s orbital motorway, the M25, is not a circle (as many people suggest) but has a short section of trunk road joining the ends and crossing the River Thames east of London. That road, the A282 Dartford Crossing, has an associated charge which, until recently, was collected at toll booths. Originally the tolls were to be removed on 1 April 2003 under the original Private Finance initiative (PFI) scheme contract that was used to finance the Queen Elizabeth II bridge but instead, under the 2000 Transport Act, the A282 Trunk Road (Dartford-Thurrock Crossing charging scheme) Order 2002 allowed the continuation of the crossing fee, which officially became a charge and not a toll. Since 30 November 2014 the toll booths have been removed and replaced by an electronic charge [update: there are some overnight journeys that are not charged], but that’s not without its issues, as I found when I travelled to Dartford and back a few weeks ago. I hadn’t used the route for years, but had heard about the changes (I even contacted the operator to see if my new tag for the French motorways, also operated by SANEF, would work – it won’t!). I also saw the signs advising me to pay by midnight the next day (confusingly using the same symbol as the London Congestion Charge, which is unrelated). Unfortunately, faced with congestion, delays, a stressful day with a difficult customer and an equally stressful journey home (total driving time for the day was 6 hours for around 180 miles – a pathetic average speed considering it was mostly on motorways!) – and I forgot. It was an honest mistake and, when I realised a few days later, I called the Dart Charge contact centre. Aided by some extremely patient and helpful people, I was told not to worry, to wait for the penalty charge notice and that I would be given a chance to pay (without penalty) on my first infringement. But I’d travelled both ways! In turns out that’s OK too – just pay all outstanding charges on receipt of the first notice. I was also told how I could sign up for automatic payment in future (a facility I tested on a journey to France a few weeks later) – if only the official government website for the Dart Charge made that clear but it’s one of those sites that’s been so over-“simplified” that it’s no longer clear. The warning letter is equally confusing: because my PCNs arrived on different days (and I needed to pay before leaving the country on Easter holidays! ), I couldn’t see how to pay all outstanding charges in one hit online. Luckily the contact centre for the Dart Charge came to my rescue again! 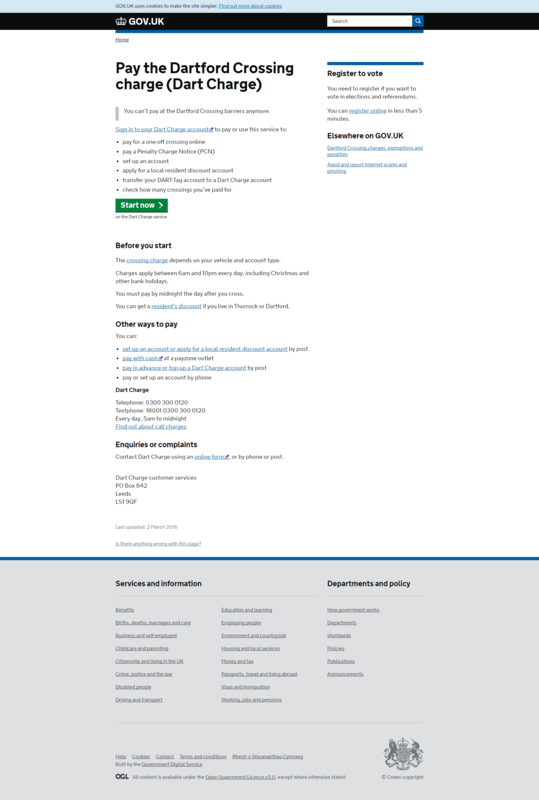 Gov.UK suggests setting up an account but doesn’t mention the advantage of doing so is to provide a pay-as-you go facility. Indeed the only reference to payment in advance is by post! There’s actually better advice in the Daily Telegraph article about the changes! So, if you are planning to use the Dartford Crossing (by bridge or tunnel), I recommend signing up for an account and paying as you go by credit or debit card to avoid a lot of stress (and potentially hefty fines). Definitely worth it! CANbus, replacement car stereos and dodgy steering wheel controls! One of the side effects of no longer having a company car is that I’m having to take direct responsibility for maintenance again. It’s a world away from my days of learning how to maintain my Mum’s 1980 Ford Fiesta! For example, I recently learned how the wiring in modern cars is totally changed so that it uses a controller area network (CAN) and a serial bus to integrate the various electronic components and to reduce the amount of physical wiring in use. This CANbus system uses common wiring (CAN high and CAN low) and each device communicates using its own frequency… or at least that’s how it was explained to me. Last month, I had a new car stereo fitted in my family’s 2008 Golf. The Pioneer DEH-4700BT was a bargain at just under £79 (from Halfords) including Bluetooth connectivity to multiple phones for calls and media playback but, by the time fitting and the various cables/adapters/fascia components had been added, the cost had gone up by another £100! I’m amazed what a difference the new head unit makes on the existing speakers (apparently manufacturers tend to over-specify the speaker to avoid warranty claims if they are “blown” early in the vehicle’s life) but I also learned a little about the car electrics whilst it was being fitted for me. Initially, the unit was wired in with a live feed taken from the cigarette lighter socket; however that wasn’t needed once all of the necessary parts arrived – the final piece being a stalk control adapter for integration with the steering wheel controls (I can re-use the permanent live if I buy a dash cam in future). Unfortunately, the use of these third party interfaces to the Volkswagen CAN has an interesting side-effect as it seems it listens for control on a range of frequencies, rather than a specific signal. This means that, when I use the steering wheel controls to adjust the car’s multi-function computer (e.g. to switch from fuel economy to distance driven), it skips forward/back a track on the stereo! One workaround is to switch the stereo to Aux input before changing the computer settings, then switching back again – but it is a bit clunky really! I’ve since found a Mk5 Golf GTI forum post that suggests using Volkwagen’s own single-DIN facia unit and a Connects2 steering wheel interface. It certainly looks like a better finish but having already shelled out over £100, our car (which is certainly no GTI) will keep the AutoLeads version for now (I have an AutoLeads PC99-505 with PC99-SON, which I’m told is the same as the PC99-PIO Pioneer version, a PC2-75-4 harness adapter and an FP-17-03 fascia adapter with removable pocket). Tomorrow, the leased Volkswagen Tiguan (2012 model) that I’ve been driving for the last three years is being collected. Only last week, I worked out how to do what I’ve wanted to do for most of the time I’ve had the car – i.e. to have one phone connected over Bluetooth for calls (my work phone) at the same time as another is connected for playing music/podcasts (my private phone). Connect the phone that you want to use as a phone to the car. In the video you can see “Mark Wilson’s Lumia” is connected. using the steering wheel controls, scroll down to Bluetooth and click OK.
Scroll down to Media player and click OK. Select Paired devices and click OK. Select the second device (in the video it’s “Mark’s iPhone) and click OK.
Click OK at the Connect prompt, and again at the “End current connection?” prompt. After a few seconds, the second device should connect and you can play media content from this, whilst still making/receiving calls on the first device. “You do need two people. One operates the central lock switch on the drivers door while the other tries to open the passenger door. You try and open the door at the same time as it tries to unlock. I tried this a few times with the outside handle (I could hear the lock “clunking” but the door still wouldn’t open) then I tried with the inside handle a couple of times and – hey presto, an open door! I think the mechanism could do with some grease (not sure what sort), but seems to be working at the moment. Incidentally, Know Your VW is a useful site (although it is intended for the North American market). After buying my Tesco Hudl a few weeks ago, I decided to get a memory card to expand the on board capacity (e.g. cary more music/video with me). Of course, Tesco is the last place I want to buy accessories like that and I picked up twice the capacity for half the price (or something like that) at MyMemory.co.uk. The problem came when I wanted to insert the card into the Hudl. For a while I seriously thought I had a faulty tablet that would need to be returned (a bit of a shame after getting it just how I wanted it, including rooting and customising…) – I kept on pushing the card in but it would spring straight out again. It turns out that the Hudl’s card slot is very deeply recessed and some long nails (or even a knife) might be needed to push it in far enough and get it to stay in place! Listen to a cycling podcast or read a cycling campaign website and you’d be forgiven for thinking that all of the issues with cycling in the UK are down to motorists, poor road design, and the mixture of large vehicles and vulnerable cyclists. So, as I wandered from Vauxhall station in South West London to my hotel this evening, I was flabbergasted to see just how few cyclists had adequate lighting. Perhaps as many as a quarter of the cyclists I saw on the Albert Embankment just after dusk had either no lights, or lights that were so dim as to be useless. I even saw one rider, in black clothes and with no illumination, concentrating more on operating his mobile phone than watching the road ahead. I also watched as a concrete mixer truck pulled out of a petrol station, then waited for a barely-visible cyclist who appeared a few feet away: nice road bike; nice gear; no lights; death wish? It’s not an isolated incident either. This morning, I had a ringside seat from the top deck of a bus as I watched a cyclist cut down the inside of a construction lorry, despite large warning signs on the rear of the vehicle warning cyclists of the danger (and the tragic loss of life earlier this week when another cyclist was killed after a collision with a tipper truck – for the record, I’m not suggesting that the cyclist who died was at fault – we simply don’t know – but that there are clear and evident dangers and the cyclist this morning was being reckless). This is in spite of the efforts of organisations like TfL and RoadPeace with campaigns like See Me Save Me trying to warn of the danger presented by large vehicles. There was an excellent piece on ITV’s The Cycle Show about the issues that truck drivers have in seeing cyclists – and even the dangers that advanced cycle stop lines can present (it’s a pity it’s not been released as a public safety film). It may be a minority that give the rest of us a bad name (I’m a cyclist as well as a motorist – and I can recount stories of idiot drivers too) but it’s a significant minority and the consequences could be fatal. Maybe the Times’ Cities Safe for Cycling campaign should focus on educating cyclists on the dangers they present for themselves and others, rather than just on the dangers that they face from other traffic.